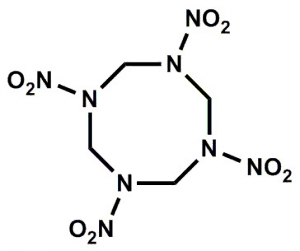 Chemring Nobel is the largest and most experienced supplier of HMX in Europe. HMX is the most powerful high explosive produced in industrial quantities today. It is a relatively insensitive, temperature-stable and safe-to-handle high explosive that makes it useful in a variety of applications both in military and civilian end products. HMX consists of opaque/transparent crystals with typical crystal sizes ranging from less than 10 microns to more than 1000 microns. Its melting point is 280 °C with a crystal density as high as 1.9 g/cm3. At maximum density its detonation velocity is 9100 m/s with a detonation pressure above 39 GPa. Chemring Nobel started production in 1968. RS-HMX (reduced sensitivity) for IM (Insensitive Munitions) purposes. We can deliver a series of crystal sizes and size distributions according to specific customer requirements in addition to the military standards mentioned above. For optimum processability we can also deliver spheroidised crystals. Crystal morphology and sensitivity can, within certain limits, be adapted to the customer’s needs. We are producing a broad spectrum of HMX-based compositions adapted to customers’ production technology and sensitivity and performance requirements. Such compositions contain from 1 – 15 % weight of binder material. Commonly used binders include different types of waxes, thermoplastics and thermoplastic elastomers, some of them with a plasticizer. These compositions are delivered in bulk as dry, free flowing granules, adapted to different pressing techniques and equipment. We deliver pressable compositions according to military specifications such as, for example, PBXN-5, LX-14 and PBXN-9. We can also deliver according to specific customer requirements, and we have our in-house developed compositions as DPX-2 and DPX-3. These are compositions based on TNT or alternatively DNAN as a binder material for HMX. This product group is called Octols. Viscosity, processing properties and composition can be adjusted by optimization of particle sizes and particle size distributions. For this type of composition we can deliver different premixes where a plasticizer is used as a desensitizing agent for the HMX crystals. Typical plasticizers used are DOA, DOS, and IDP, among others. We deliver standard compositions such as CXM-10 which is used in PBXN-110. We can also deliver HMX that is desensitized by energetic plasticizers. We are also producing HMX formulations with binder systems designed for extrusion.